to office looks and this week won’t be any different. My inspiration, this time, comes from Marc Bale and The Peach Box jewelry. I recently got a black and gold watch from there and a pair of gold pearl earrings. So, this time, I created my look around the accessories! I used a black top with mid length sleeves with nice metal details. I paired it up with check trousers in order to create more sophisticated look, but also to avoid dressing all in black. As I usually do in the winter months, I used black heels and a handbag to finish the look. 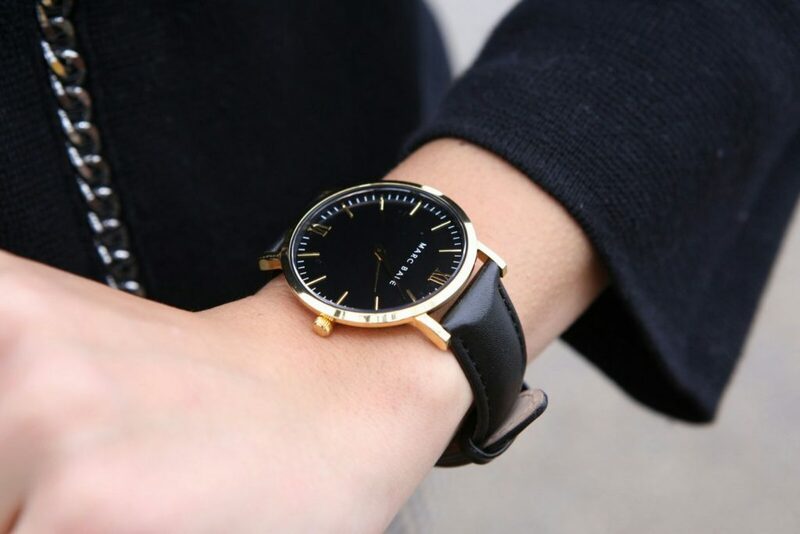 The black leather strap of the watch matches perfectly the leather shoes, and the leather details on the handbag. I went for a sporty type of handbag, as the metal chain matches the top details and makes the look less sophisticated. The pointy shoes bring elegance and stryle to the look and are always perfect finish for your office apearance. Next Post Pink for Spring?